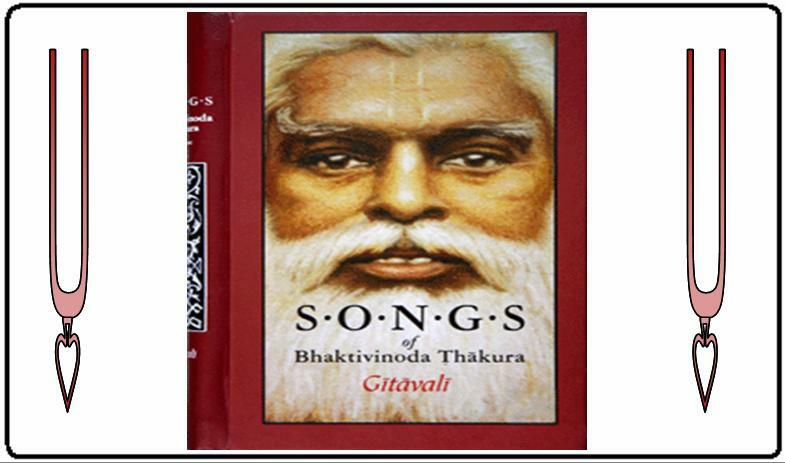 Gitavali is one of the best known works by Bhaktivinoda Thakura. This book is all about kirtanas and glorifying the Lord. Except for a few songs, the mood of the entire book is joyful and ecstatic in singing kirtanas. The first chapter is the morning kirtanas. The next chapter sings aratis, or ceremonies of worship of Deities. The aratis worshipped are Gaura Gadadhara, Lord Caitanya, Radha Krsna, and Lord Krsna before enjoying bhoga. After enjoying bhoga, the six prayers of glorifying the leftovers of the Lord’s meal, known as prasada, are found. They are known as the Prasada Sevaya. Then, there are two sets of kirtanas that are meant to be heard loudly on the streets of towns and villages. The first is for Lord Caitanya and the next is for Lord Krsna. The Gitavali then goes into a slightly more philosophical approach with Sreyo Nirnaya and Parisista. Then three astakams (set of eight songs) are there to glorify the holy name and Srimati Radharani. The last astaka serves as a purport to the eight verses spoken by Lord Caitanya known as the Siksastaka.